Radio remains an integral part of many strategic communications plans and campaigns. But in the era of social media, are you taking the necessary steps to integrate radio and social strategies to maximize results? Radio remains, and will continue to be, an effective medium to be utilized as part of communications plans. According to Nielsen/Arbitron, over 91% of Americans listen to radio, and it’s still a major platform in which many Americans receive their news. 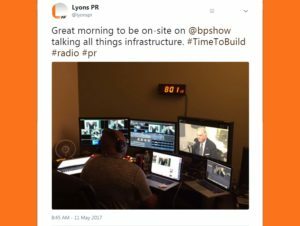 Radio Media Tours are a commonly used tactic for PR campaigns, but, like everything else in the PR industry, they too have evolved. While radio outlets continue to produce superb content, how people listen and receive that content is changing. Social media hasn’t killed radio, rather, when it comes to radio media tours, it has afforded the opportunity for an extended shelf life. So before embarking on your next radio media tour, bear in mind these tips to integrate social media into your radio outreach to maximize efforts. Now that you have your RMT in place, use your social media channels to promote upcoming LIVE interviews. On Twitter and Facebook you can “tag” the station by following them on social media and tagging them by using the station’s handle. You can then add a link where would-be listeners can easily access the audio for the interview. This is an opportunity for listeners to listen to the interview when outside of the listening area or simply directly from their computer or smart device. Nearly every outlet has a presence on social media, most notably on Twitter and Facebook. Not only can you promote your interview ahead of time on social media platforms, but you can also engage with the station from there to help establish your relationship with them. One easy way to do is by simply following the station and on Facebook and Twitter. If they post something in relation to your booked interview, it gives you an opportunity to retweet, like and share and get additional mileage to your RMT booking. Now that the radio interview has aired, you now have a second opportunity to promote and now share the audio from the interview. Once you have audio – either from the station aircheck, or if you were able to record on your own – you can now post and share it on your organization’s Facebook, Twitter, and other social media channels. This provides an additional opportunity for your followers to listen to the interview even if they weren’t able to tune in live, or if the interview was originally booked as a recorded interview on the RMT and the interview aired later as clips. When it comes to integrating the old and new media, there’s no more perfect marriage than radio and social media. Gone are the days in which an interview airs for its coverage area and for a short amount of time. With the added benefit of social media, your organization’s radio media tour can expand its audience size and extend its shelf life.